Pamela O'Hara, writing under the pen name Dianne Cooper, spent more than two decades incarcerated in prisons across the country for a non-violent crime, all while proclaiming her innocence. Pamela is an advocate for imprisoned fathers and works to help them reestablish relationships with their children. She is a motivational speaker and encourages others to make sure that one's past does not define one's future. Dark Justice is a true crime memoir written by Dianne Cooper. The author’s childhood was abruptly ended when she became pregnant at the age of fifteen. Her father rushed over to Joseph’s house to confront his minister father and demand that Joseph marry his daughter. The two came to blows, and Cooper’s father subsequently chased her through the house with a broom after she stood up to him and refused to marry Joseph. Cooper did, eventually, marry the father of her, by then, three children, thinking to provide them with a stable family life, but the early instincts that led Cooper to defy her father were proven unerringly accurate as their married life proceeded. Joseph became addicted to crack cocaine and, after he injured his back at work, did little to help raise their children or support the household. After years of being the sole breadwinner, Cooper had had enough and filed for divorce. When a handsome man courted her, and friends marveled that she had caught the eye of the biggest drug dealer in town, she yielded to the temptation of having another person care about her and help her with her financial obligations. What’s more, the two of them had formed a bond of friendship and trust she had not experienced outside of her immediate family. But while Cooper remained a caring and devoted parent who never gave in to the temptations of hard drugs or the easy money of dealing, complications arising out of that friendship she shared with Diamond and a corrupt legal system were poised to fall upon the young mother in the harshest way possible. 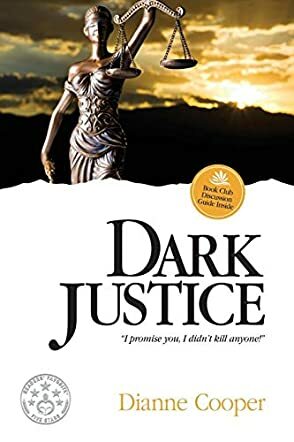 Dianne Cooper’s nonfiction true crime memoir, Dark Justice, is a chilling look at the vagaries of a justice system that rewards lies and false testimony in the pursuit of prosecutorial goals, and treats those caught within its machinery in a dehumanizing and heartless manner. The author’s story is told with honesty and candor, and I cringed each time I saw her legal rights trampled and her life impacted even more severely. While newspapers often contain stories about innocent people getting lost in the system for years, Dark Justice brings a face and a life and a family into the equation and makes the injustice hit home in a personal and penetrating manner. And while I know from the prologue that the author was 54 years old at the time she wrote Dark Justice, and had already served 18 of her forty-to-life sentence, I kept on hoping that some resourceful attorney would be working on freeing Ms. Cooper and that she’d be finally free to enjoy watching her grandchildren grow up and be back in the warmth of her family. I still do hope so, and am looking forward to reading her sequel to this book, Searchin’: Dark Justice 2. Dark Justice is highly recommended.